With Christmas just around the corner, I wanted to bake one of my favorite cookies using entirely organic ingredients. I tried to find a suitable replacement for the Hershey Kiss, but was unsuccessful. Oh darn! 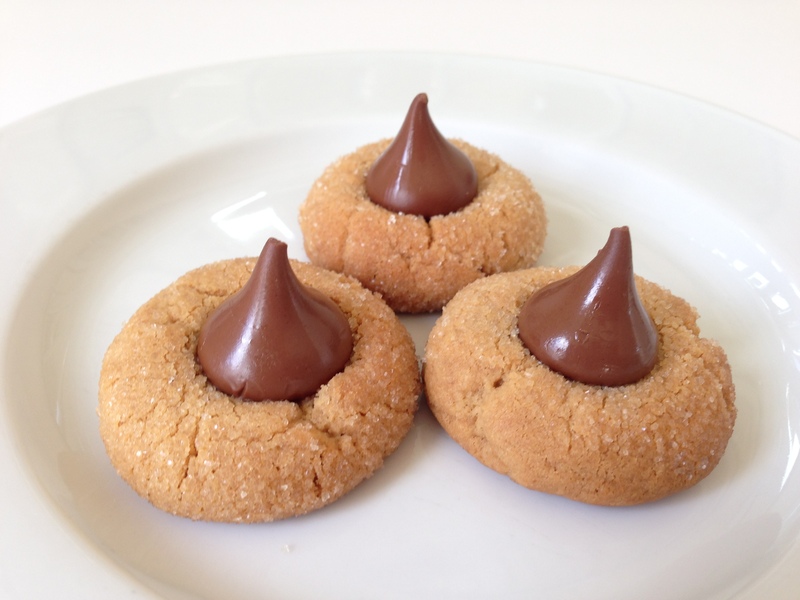 So here is the recipe for Hershey’s “Peanut Butter Blossoms” using organic ingredients, except for the famous foil-wrapped Kisses! Preheat oven to 375 degrees. Take the foil wrappers off the Kisses. Beat butter and peanut butter in a large bowl, until well blended. Add 1/3 cup granulated sugar and brown sugar, beat ingredients until fluffy. Add egg, milk and vanilla extract, beat until well mixed. Stir in flour and baking soda. Shape cookie dough into 1-inch balls. Roll in granulated sugar and place on cookie sheet lined with parchment paper. Bake for about 14 minutes or until lightly browned. Immediately press a Kiss in the center of each cookie. The cookie will crack around the edges. Place on a wire rack to cool. Makes about 48 cookies. Blogger’s Note: I omitted the salt, used nonfat milk, and only rolled the top half of the cookie dough balls in sugar. I always try to reduce sugar, fat and salt, whenever I can.